Aerial lift safety has never been more important or visible in the news. A recent OSHA event highlighted the importance of fall protection on aerial lifts, scissor lifts, and aerial work platforms (AWPs). At the 2018 National Safety Council Congress & Expo, OSHA’s Directorate of Enforcement Programs, Patrick Kapust, revealed the top 10 safety violations reported to OSHA in 2018 for the fiscal year ending on September 30th. Fall protection again ranked highest on the list, with 7,270 violations. That’s almost 3,000 more than the next-highest violation (hazard communication). Mr. Kapust said that fall protection requirements remained a central focus for OSHA auditors and investigators. “The Top 10 represents the most frequently cited standards, and they are a good place to start for the employer in identifying hazards in their own workplace,” said Mr. Kapust. Safety training is a big component in reducing the top 10 OSHA violations for 2019 and beyond. Aside from thorough training, which is required by OSHA for every U.S. employer, there are some great new safety products that also aid in overall workplace safety and productivity. At CertifyMeOnline.net, employee safety is our primary objective. With a great selection of aerial lift and scissor lift safety courses, we’ll help any company become OSHA compliant in no time. With easy online access, updated training content, and in-house OSHA expertise you can count on, CertifyMeOnline.net is your best option for workplace safety – along with the new products listed below! 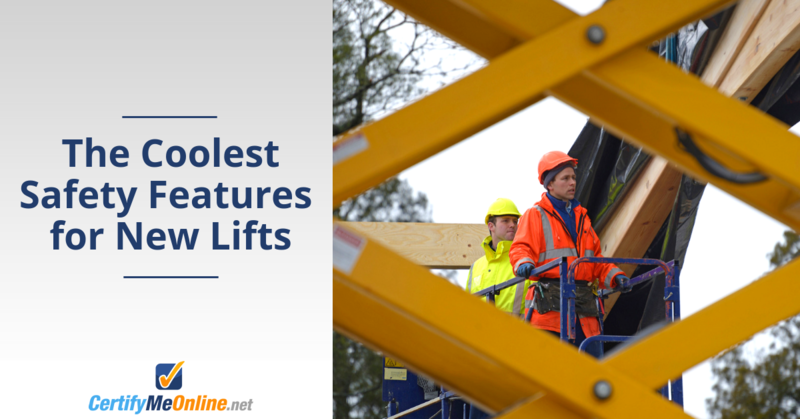 Let’s review some of the most popular safety accessories for aerial lift operators, scissor lift drivers, and other aerial work platform (AWP) employees. OSHA offers some common sense fall protection measures in their Aerial Lift Safety Fact Sheet. From making sure gates are closed and locked to using harnesses and restraining belts, there are plenty of things workers can do to increase safety. Sometimes, it helps to have extra safety aids and accessories to lower the chances of accidents or injuries. With a shock absorbing lanyard, proven safety results, and complete fall protection coverage, this Harness and Lanyard Combination set provides a smart and affordable solution to any company’s basic fall protection requirements. Here’s another harness system that prevents falls. This safety harness also offers premium comfort and supreme wearability, so employees won’t have to worry about a harness that bunches up or impedes work. When it comes to fall protection, anchoring is everything. Without a reliable anchor point, accidents are bound to happen. But this D-ring anchorage plate offers a durable, reliable solution for your anchoring needs. This plate bolts or welds to any structure, and is made of corrosion resistant steel for outstanding performance over many years. Sometimes, convenience helps with fall protection safety. This cross arm strap and tie-off adapter is an outstanding accessory to hang tool bags and other accessories. And with a 400-pound maximum carrying capacity, it’s always helpful to have an alternative fall protection component on hand – you never know when you’ll need it! A reliable, easy-to-use carabiner is always handy in a pinch, especially for aerial lift and scissor lift operators. This durable steel carabiner has an auto twist lock feature and is ANSI compliant for performance under pressure. From transferring fall protection anchor points to having an extra set of hands in the air, an extra carabiner or two is always recommended for any AWP employee’s gear kit. Sign Up with CertifyMeOnline.net Today! With the best fall protection accessories and OSHA compliant training, your employees are prepared to handle anything. Better safety, increased peace of mind, worry-free OSHA audits – with aerial lift and scissor lift training from CertifyMeOnline.net, your company will enjoy superior safety and enhanced productivity! Check out our courses and get started today. If you have any questions about our training modules, or if you need help with your company’s fall protection requirements and need training today, call our aerial lift training experts today at (602) 277-0615). Thanks for visiting CertifyMeOnline.net! This entry was posted in Aerial Lift Certification on November 27, 2018 by admin.